The Flying Dutchman is a 1,600 foot couloir that climbs from the west end of Chasm Lake to the north edge of the Loft. 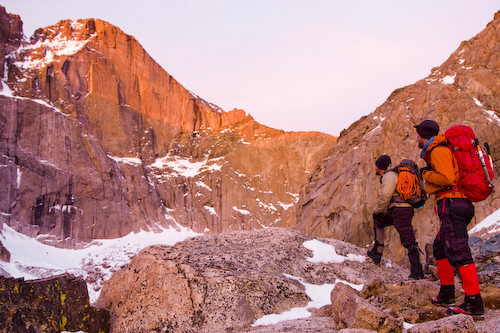 To approach the climb, hike around the north side of Chasm Lake. 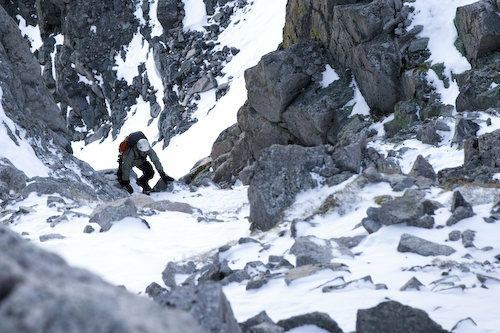 When this route is in condition, it offers quality steep snow climbing punctuated by a short, 55 degree water ice crux. Eds. note the consensus rating is not accurate due to the constraints of mixed rock, ice, and mixed climbing ratings. Sorry! Most of this route is on steep snow. Pickets can be used and rock protection can be found along the west edge of the couloir. Two ice screws protect the crux ice. Looking down from the middle of the climb. At the base of the couloir, just past Chasm Lake. The crux section of the climb on 6/1/03. We climbed the Flying Dutchman on 6/01/03. The snow conditions were pretty good although a bit soft and melting fast! Crux conditions: we found a mixture of rock and ice interspersed with a samll water fall. We climbed the rock/ice section on the left since the pure ice alternative was hollow and seemed ready to come down. All in all, a great route with awesome position. We got blasted by a weird, winter like snow storm, as we reached the Loft and proceeded to descend in poor visibility via the loft route. Just got back from doing an ascent on the Dutchman and descent down the Loft. Not a whole lot of ice right now, guys. (I had a total of two swings into actual ice.) The snow was super hard packed in places though, allowing you to cruise for most of the way. Having one ax and one tool (or a set of alpine tools for easier plunging) would have been ideal at this time. Expect some dry tooling/awkward mantling through the crux in a no fall zone. We didn't break out the ropes once; however, it was nice to have the rope and pro just in case a rappel was needed. I'm not sure what this latest storm is going to bring, but yesterday snowshoes were not necessary for the approach. There's a fair amount of slick ice on the main trail, so trekking poles wouldn't be a bad idea. Note: if you are descending the Loft, be sure to find the easier class III route down. 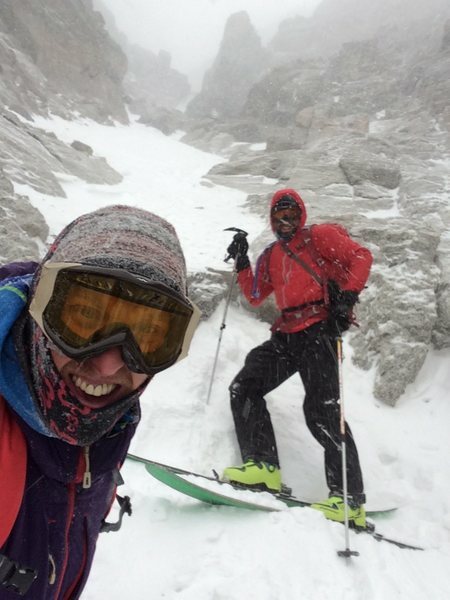 We got nailed by a nasty storm with 50mph+ gusts in near whiteout conditions and ended up on a super sketch, 5th class traverse along a snowy cliff face just below our intended exit route - looked like it would have been an amazing summer scramble though! Scoping out the route of the day. Lars just finishing up the Dutchman's crux. Can anyone tell me about the descent off this route?